On the Beyond the Blast Door Tour, you’ll explore areas of the missile site normally closed to the public. 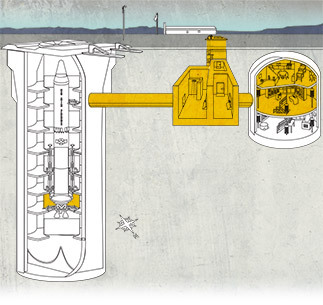 See where the crews ate and slept and then descend more than 100 feet underground and enter the launch duct. Experience a view you’ll never forget as you stand directly beneath an actual Titan II missile! This tour is offered on the first and third Saturdays of every month at 9:30 AM. It lasts approximately 1 hour and 45 minutes, and also includes a visit to the underground launch control center where you’ll experience a simulated launch of the missile. 1st & 3rd Saturday mornings of each month. Check in at Admissions no later than 9:15 AM or your reservation may be canceled. This tour is limited to 20 people and is NOT handicapped accessible. You must be able to descend and climb multiple flights of stairs during the tour, and you must also be able to climb six 15-foot ladders, one after the other, in an emergency. We are very strict about this physical requirement. If staff has any doubt about a visitor’s ability to climb six 15-foot ladders, the visitor will not be allowed to go on the tour. You must be at least 12 years old to go on this tour. Closed-foot (with no cutouts or holes), sturdy walking shoes with rubber soles are required. Your foot/sock should not be visible from the ankle down. Flip flops and sandals are absolutely prohibited. Large purses, bags, camera bags and backpacks are also prohibited on this tour. The tour is assembled at 9:20 AM so that staff may provide a safety briefing to tour participants. Please arrive at the museum no later than 9:15 AM so that you have time to pick up your tickets and use the restroom prior to the safety briefing.